January 22nd, 2016. For most Penguins fans, just another home game against the Philadelphia Flyers- obviously important for bragging rights and playoff positioning, but nothing out of the ordinary. 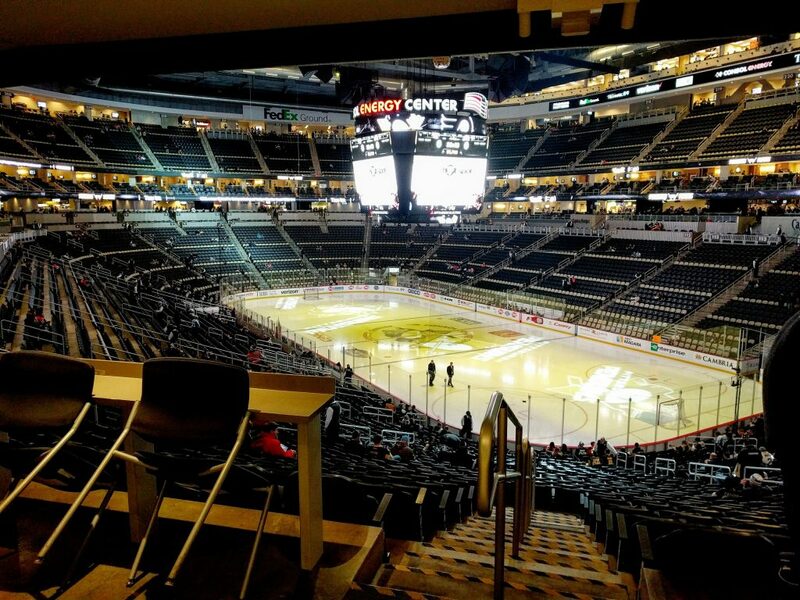 For me, it was the first time I’d stepped into Consol Energy Center, the house that Mario and Sid built; the first time I’d seen in person the ice that had long been almost mythical, on the other side of the computer screen. After almost 6 years of dreaming and supporting them from afar, I was in Pittsburgh, watching a Penguins game. I’m not ashamed to say that as I turned a corner and saw the ice from up on the concourse, I teared up. The ice at Consol Energy Center. I started watching hockey back in 2010, thanks to the efforts of my very good friend Ellie who convinced me to come and see our adopted hometown’s professional team, the Sheffield Steelers. I’d been to games as a child, back in Manchester (in the UK, not New Hampshire!) when the Manchester Storm were drawing big crowds to the Nynex Arena, but hadn’t really taken in the game- I was a small kid, I just liked the atmosphere and the music. When I first saw Sheffield at the age of 22, something clicked- it was the perfect combination of elegance and brutality, skill and determination. This was the sport for me. I watched a few NHL games, mostly picking random teams to try and find one that I liked. I still remember the first Penguins game I watched, against Tampa Bay- I vaguely knew the Lightning’s name, but I hadn’t heard of the Penguins. I was entranced. It was 2010, the year after the cup win but still firmly in the Bylsma era- this was an up-tempo, high-offense team with a core of incredibly dynamic players. They played the game beautifully, and I remember them completely out-skating Tampa Bay. I flirted with a few other teams for a while (including Vancouver- thankfully I didn’t go any further down that road, given how badly mismanaged that franchise has been) but by the time Jaroslav Halak and the Canadiens had stonewalled the Crosby and Malkin-less Penguins in the 2010 playoffs, I was a committed fan. During that offseason I spent a lot of time researching the team. I had been attracted to the Penguins because of the way they played- after spending some time on Wikipedia, I became entranced with the city and the team’s history. The towering legacy of Le Magnifique; Mario’s incredible return from cancer; how he saved the club and kept it in Pittsburgh; the back-to-back Cup wins; and of course, Sid the Kid and his impact on the city. The story of the Penguins was, to my eyes, one of determination, triumph in the face of adversity and a passionate love affair between the team and the city. As the next season rolled on, including Crosby’s incredible 25-game point streak and of course, the Winter Classic, I continued to read about Pittsburgh. The opening shots of every home broadcast showed me how beautiful the city was, and HBO’s 24/7 documentary leading up to that fateful evening at Heinz Field convinced me that this was my team. The similarities between my own adopted hometown of Sheffield and Pittsburgh began to mount up- both are ex-steel towns, both have coped with the decline of the steel industry by moving into higher education (Sheffield has two universities, Pittsburgh has four) and technological innovation; our hockey team (established in 1991) is called the Steelers. Even my university’s team colours are black and gold (the only thing spoiling this is that my Steelers’ team colours are, annoyingly, orange and black!) I dreamed of visiting the city, of watching a Penguins game, eating at Primanti Bros’, seeing the view from Mount Washington. As the Penguins sputtered through that horrific 2012 series against the Flyers I was up until 3am watching every game; the same the next year when Fleury ceded the net to Thomas Vokoun and the Pens advanced all the way to the Conference Finals before being stoned by Boston. I watched Crosby’s struggles with concussion and his effervescent return against the Islanders on November 21st 2011 (that backhand goal, and Sid’s passionate celebration!) I couldn’t hope to count the hours I’ve spent (usually in the small hours of the morning, huddled in front of my computer with headphones on) watching games online, following along on Twitter and going to bed either joyful and animated or sullen and angry (depending on the result), before waking up for work the next morning. Late last year, I decided to take the plunge- to make my pilgrimage to Pittsburgh and finally watch a Penguins game in person. I went via Austin, spending a few days with a friend there, before taking an afternoon flight to Pittsburgh through Dallas. I was staying with some AirBnB hosts up in Grandview, who’d arranged to pick me up at the airport; as we drove back, late at night, they graciously agreed to take a detour through the Fort Pitt tunnel. The city unfolded in front of me, covered in a light dusting of snow, and I had to pinch myself- I was really there. I left the house quite early the next day, eager to tick some things off my bucket list. 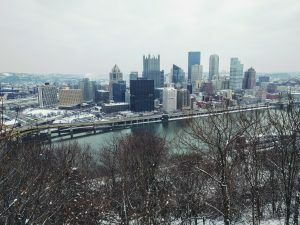 I marvelled at the sight of the city from Grandview; I rode the Monongahela Incline down to Station Square; I convinced myself that I was sitting just behind Dejan Kovacevic as I took the T across the river into downtown. I wandered up to Consol and bought a Pittsburgh Gold jersey at PensGear, ate lunch at Primanti Bros’, had a brief skate on the temporary rink in PPG Plaza. By the time the Flyers game rolled round, I had fallen deeply in love with Pittsburgh, and the incredible atmosphere and result that night only cemented it for me. My neighbours on either side at the game were friendly, polite and passionate- I felt immediately at ease. As I walked back up Grandview that night, the city twinkling with a million and one golden lights on the other side of the river and my face slowly going numb from the freezing cold, I couldn’t have described the feeling of travelling thousands of miles, across half the world, only to feel like you’d never left home. Pittsburgh is a very special city. I know I’m probably reading a lot into the relationship between the city and my own home of Sheffield, but the connection between the two (for me, at least) grows stronger by the day. 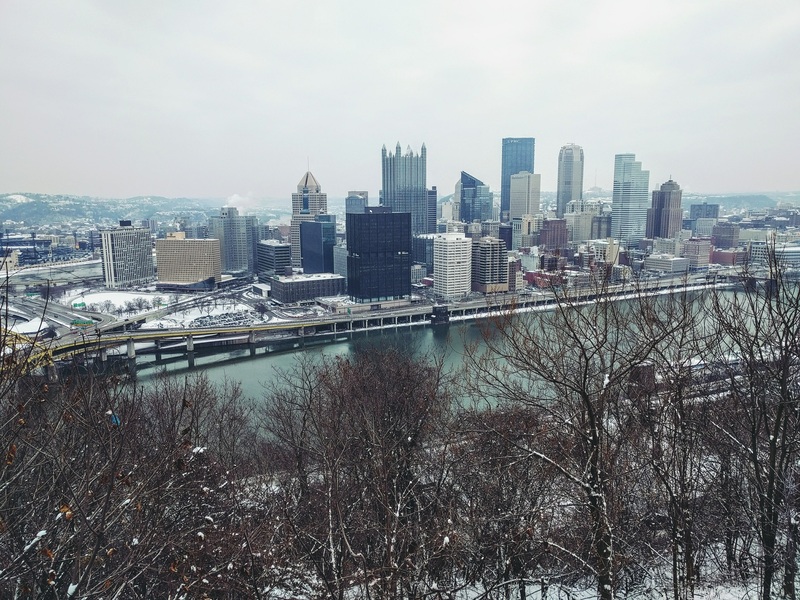 Sheffield is built on and around seven hills; Pittsburgh might not have seven, but it certainly has a lot of ups and downs. Sheffield is the fourth-largest city in the UK, but feels like a small town where you know everyone; Pittsburgh has exactly the same feeling, and several Uber drivers told me they always see someone they know in Downtown while they’re there. Sheffield has a blue-collar, working-class ethos (it’s often jokingly dubbed ‘The People’s Republic of South Yorkshire’) which is mirrored in Pittsburgh. We have slightly more rivers (five in total) but they’re smaller, and we have fewer bridges. And of course, there are the people- everybody I spoke to was friendly and welcoming, more than happy to share their love for their city with me. My AirBnB hosts made me feel instantly at home, and I couldn’t have asked for better people to stay with. I know from personal experience how friendly Sheffield people are- it’s often called the biggest village in the UK, since it’s developed such a reputation for friendliness, and it was wonderful to see that Yinzers have the same approach. And above all, both Pittsburgh and Sheffield have hockey. We have one professional team, a few semi-professional teams, a slew of recreational teams and a veritable army of passionate fans at all levels. Lord Stanley’s Cup was even forged by a Sheffield silversmith and sold from a London shop, so in a sense, the NHL and the most iconic trophy in sports was born in my city. The Steelers have gone through their own hard times and their own struggles, not helped by the collapse of the British IHL in the late 90s, but since the birth of the current Elite Ice Hockey League in 2003 they have won five championships and a slew of other trophies, including back-to-back championships this season and last. As Pittsburgh and Sheffield reflect each other in so many other ways, my hope is that this year’s Penguins will reflect Sheffield’s success- and bring the Stanley Cup back to the Steel City where it belongs. I’ll be watching from the other side of the Atlantic and rooting for the team, as I have done for the past 6 years. Pittsburgh is as much my home as Sheffield, in the emotional sense if not the physical, and I’ll be there in spirit as the Cup is paraded down the Boulevard this year.